Scientists have developed the first bionic prosthetic hand which allows the patient to feel different textures. This is achieved by implanting electrodes into the nerves which is an exciting development in treating amputees. The distal radius is one of the large forearm bones and it is commonly injured. Broadly speaking types of fracture sustained ifall into two groups depending upon their age. In younger people the bone is harder and the fracture is usually as a result of a major impact, such as a road traffic accident. In patients over 50 years of age the bone is softer and the radius can fracture after minor trauma such as a simple fall. These are usually immediately present immediately after the injury. An x-ray is usually all that is required to diagnose the fracture and provide sufficient information for treatment. Sometime further investigations such as a CT scan may be required to either confirm a fracture or provide additional information to help with the management. Fractures that are not displaced with the bones sitting in their normal position can usually be treated in a cast. For the first few days after the injury this may be a half cast or 'back slab' which will accommodate any early swelling. Later this is changed to a complete cast immobilising the wrist and forearm but leaving the fingers free to move. In most cases the fracture will have healed within 6 weeks. There are several types of surgical treatments available and this is usually required for fractures that are displaced with the bones are not lying in their normal position. Some fractures can be treated by manipulating the fracture after administration of some form of pain relief, such as local anaesthesia or 'gas and air'. If a satisfactory position is achieved and the fracture is stable, a cast can be applied. Treatment then continues as for non-operative management. Regular x-rays for up to 3 weeks may be necessary to ensure the fracture remains in the correct position. This is usually required for fractures that can be reduced by manipulation but they are unstable. The insertion of smooth pins inserted in the operating theatre through the skin temporary holds the fracture until it has healed. Post-operatively a cast will be required for 6 weeks after which the wires are removed. In most cases the wires are left poking out of the skin and can be removed in the outpatient department. This is another method of holding unstable fractures after reduction. 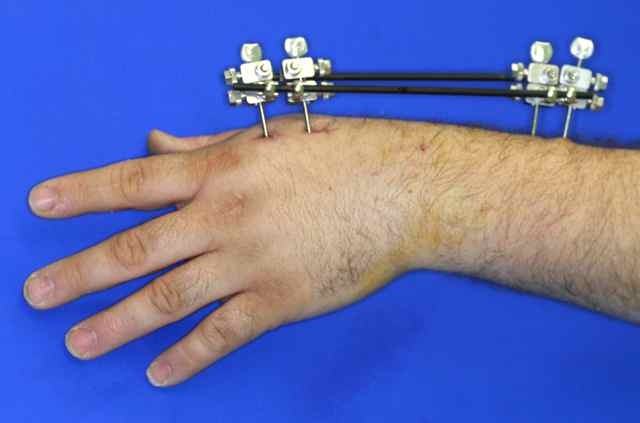 Larger pins are inserted into the bones and these are joined together using a frame that sits outside the skin. Usually these are removed in the outpatient clinic after 6 weeks. Some fractures can not be reduced by manipulation and these require surgery to reduce the bone fragments from inside. This is more likely to be required with fractures involving the joint surface or those in the younger patients. A cut is made in the skin and once the fracture has been reduced, a metal plate and screws are used to hold the fracture. Because the fracture is held securely the wrist can be mobilised as soon a the discomfort subsides, usually within 2 weeks of the surgery. Fractures of the distal radius are common but most people make a good recovery and have no long-term problems. It is not unusual to experience discomfort and stiffness after the injury, but improvements are expected for up to 18 months. Sometimes physiotherapy may be required to help improve the range of movement, although in most cases these exercises can be performed by the patient.